Quite often I see the somewhat ominous looking “Cow Killer” ant. The name inspires dread and indeed these insects look like they could pack a serious sting. In actuality they are not an ant but rather a type of wingless wasp. And yes, they do have a nasty sting, but I question whether they have ever killed so much as a rabbit. 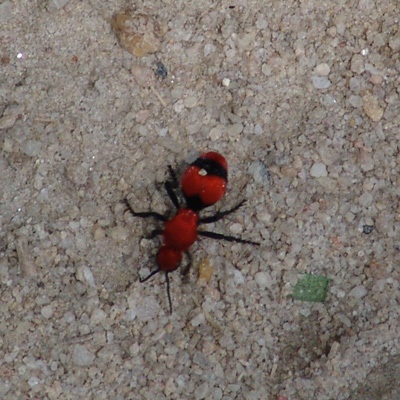 Sometimes these insects are called Velvet Ants for the velvet texture of the red on their exoskeleton. These wasp can be found scurrying along the ground at a frenetic pace and quite oblivious to your presence. Picking up or trying to handle these insects may give you a reminder that wasps can sting. Tice Brashear is the President of Brashear Realty Corporation. He is a licensed real estate broker and has over 37 years experience in selling land, farms, acreage, commercial and investment properties. He is a past President of the Georgia Association of Realtors and a past President of the Augusta Board of Realtors. This entry was posted in What is it?, Wildlife. Bookmark the permalink.